A heritage-protected Umgebindehaus has awakened from its slumber and has been looking forward to welcoming guests since September 2017. 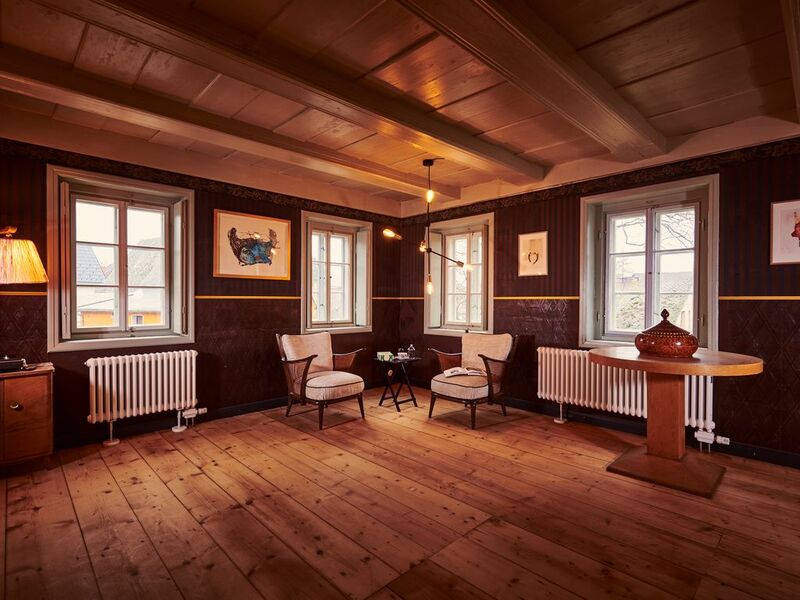 Carefully restored with the historic wallpaper from the 30s, Meissen tiled stoves, the original linseed oil paints and modern art it has 260m² living space. Lots of space for up to 12 people, a large dining table for all and a very well-equipped kitchen. Perfect for holidays together, to cook and to enjoy. For a long time, the former factor house of the cloth merchant Carl Wilhelm Henke was completely bewitched in the garden, but now we have renovated it in accordance with the monument and intervened as little as possible in the original substance. The hand-painted beaver tails on the roof have been preserved, as well as the historic box windows, Art Deco wallpaper, the original Rietschel (window folding or sliding shutters), the wide wooden floorboards, the decorated brass door handles on the old doors and the Art Nouveau tiled stoves. Overall, the house offers a tour of local architectural history from the Baroque to modern times. In addition, a modern and spacious kitchen with everything you need and could need for thorough cooking (including 90cm wide SMEG oven, Kitchen Aid, professional knife, Moccamaster, etc. ), a large dining table for all, modern heating and bathrooms , Art and antiques from all over the world, a spinet and toys for the kids. In winter, in the evening, the sauna in the largest vault of the house and in summer the garden attracts. It is a very personal holiday home, for all those who cook together in a large group, make music or just want to spend a nice time and value a certain aesthetics. There is an apartment (47 m²) in the former block room on the ground floor, with double bed, bathroom with tub and living area with art nouveau tiled stove and the original wallpaper from the 30s. As well as the large apartment (140 m²) upstairs with a large and two smaller bedrooms, dining room with tiled stove, living room, kitchen and bathroom and guest toilet. Also on the ground floor the small vaulted room (15 m²) with double bed and the sauna. The large garden in front of the house with seating, barbecue, fire bowl and sandpit is also available. For children there are also two high chairs if required, two extra cots (a wooden cot 70x140cm and a travel cot 60x120cm) and plenty of toys. It was important to us that the equipment comes as far as possible from the region. That is to say, the towels and curtains are from Leinen Hoffmann from Neukirch, the bed linen from Spreetex from Neusalza-Spremberg, the glasses from Stölzle and the Kahla crockery. The furniture is partly still originals from Hellerau or Wehrsdorf and the graphics are a mix of local artists and finds from around the world. ...überall verstecken sich liebevoll restaurierte Details, die auf die Historie des Faktorenhauses hinweisen. Das Faktorenhaus ist für Menschen, die Spaß an einer stilvollen Einrichtung haben, ein ästhetisches Ambiente schätzen und die Geschichte eines Umgebindehauses spannend finden. Das Ferienhaus eignet sich wunderbar für Familientreffen. Die Küche, das Esszimmer und die Bibliothek bieten viel Raum für Groß und Klein, für Spiele, gemeinsames Kochen und gemütliches Beisammensitzen. Wir haben im Faktorenhaus ein wunderbares Wochenende verbracht, einen spannenden Stadtausflug nach Görlitz unternommen und wir sind zur Spreequelle gewandert. Es war eine schöne Zeit. Wir haben uns sehr wohl gefühlt und werden wiederkommen. Traumhafte Unterkunft mit historischem Charme! Wir haben eine wunderschöne Woche im Faktorenhaus verbracht. Alle haben sich schnell wohl gefühlt und ihr Lieblingsplätzchen gefunden. Die Kinder waren begeistert von den vielen schönen Spielsachen, die "Köche" von der toll ausgestatteten Küche und alle Anderen von der Gemütlichkeit des Hauses. Rundum eine tolle Unterkunft! Hier Weihnachten zu verbringen in diesem schönen Haus war etwas ganz besonderes. Wir hatten hier wunderbare Tage. Die Ausstattung ist herausragend. Zudem macht die Sauna großen Spaß. Von ganzen Herzen zu empfehlen !! !